Interactive toys are a great way to keep your cats stimulated both mentally and physically, and a great way for both you and your cats to get in on the fun. 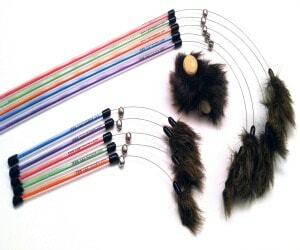 Toys such as feather teasers, wand toys or fishing pole type toys can provide hours of fun for you and for kitty. Playing with your cat is not only fun, it also increases the bond between the two of you. Of course, cats also have a fairly short attention span and get easily bored with the same old toys, so I’m always looking for new wand toys to keep Allegra and Ruby engaged and interested. All three of us were delighted when Tiger Teasers sent us one of their Synthetic Fur Toys to review. We also received some “Bunnies,” which are corks covered in synthetic fur. Tiger Teasers cat toys are handmade in the USA and are constructed with items purchased in the USA. All toys use only the highest quality materials and standards. They go through extensive safety and durability testing and come with a 100% Satisfaction Guarantee. We received The Lion Lure. It features a 24 inch long acrylic wand with a wire. The toy attached to the end of the wire looks like a furry rodent. Even though the toy also comes with real fur, I was assured that the one we were sent was synthetic, as I will not purchase fur based anything for either myself or my cats. The synthetic fur sure looks and feels like real prey, at least to me! Fur toys do appeal to cats natural hunting instincts and senses and allow for an appropriate outlet for the natural prey drive. I couldn’t wait to see how Allegra and Ruby would react. Allegra barely let me get the toy out of the tube it came in before she started to pounce. She reared up like a little circus lion, following the toy, as you can see in the adorable photo above. Ruby was equally entranced with the toy. The toys are extremely well made and I think they will hold up well even to the often rough play my two girls put these toys through. Ruby in particular can be a wild woman when it comes to playing with interactive toys. For more information about the toys, and to purchase, please visit the Tiger Teasers website. Exclusive 20% discount for Conscious Cat readers! 20% off all toys. No minimum purchase, no expiration date, no restrictions. Use code CONSCIOUSCAT at checkout. FTC Disclosure: I received this product for review at no charge from Tiger Teasers. I also received a small fee to cover the time it takes to test, take photos and video, and write the review. Receiving the free product and the fee did not influence my review. All reviews on The Conscious Cat will always reflect my honest and unbiased opinion. It looks great and I really think the fact of it being made in the USA of USA materials us Very Important. Definitely will look closer at these. Ooooh, we used to think feathers were the best, but we are liking the fur. Maybe we can drop some hints to Mommy or send a letter to Santa Paws. I think my kitties would love this toy too. They really like ones with fur and that make noise. Fur toys seem to be very popular with kitties, Sue. This is great! 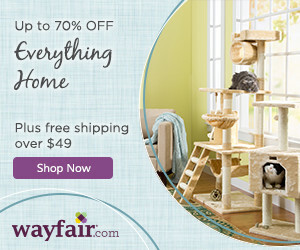 Three of my cats would love this! When I get some extra money, seeing that it is the xmas season, I will have to get some. I have one toy on a wire that I stuck behind a bookcase so it would stick out, so they could play with it when I’m not able to play with them. Two of my babies love it! I also have a very long colorful string with a fur ball and feathers on the end of it that my son used to play with, with all of them before he went to college. I got the idea to hang it from the archway of the livingroom so it hangs down. My little Sam loves it! He will jump up at it and grab it and pull it. His favorite toy however is the spring. The little plastic colored toy that is spiraled. He loves them. He carries then around in his mouth. He loses them quite a bit and I have to go hunting under the stove and cabinet for them. There are some still missing that I have no idea where they are, ha ha. They all love the laser lights and strings of any kind. My Princess will only play with a ball periodically. I adopted her from the humane society after she spend 6 months there. I believe she didn’t have much interactioon before that time and therefore doesn’t know how to play like the others. I run a string across her and she just sits there. It makes me sad when I think about what kind of life she must of had. However, I have had her for 6 years now and I know she loves her home. She used to hide all the time, afraid of everything, but now she never hides. I would like to think that if my babies could speak they would say they love being with me. Allegra loves those spring toys, too, Viki! Periodically, I will move lighter pieces of furniture and go on a spring retrieval mission. I’m sure there are dozens under the stove! Cody would LOVE those because he LOVES teasers with FUR! 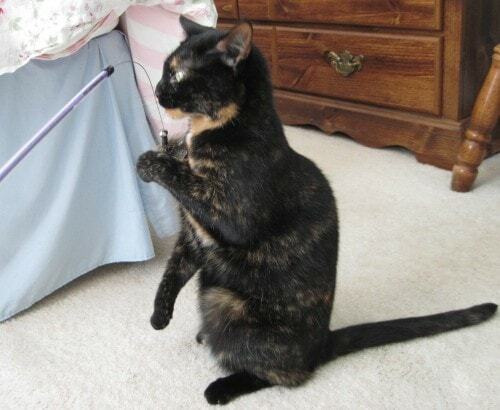 My cat TC’s favorite toy was a fishing pole with a squeaky mouse at the end. 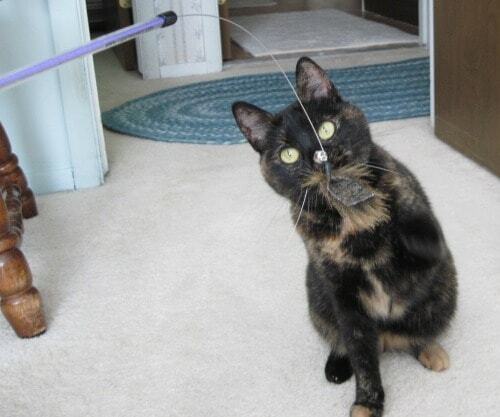 She would bring that mousie with pole attached wherever I was upstairs or down to have me play with her. We used to have one of those, Sue. I need to look for it!